A D&B report compiles available business data to measure the creditworthiness of a company. D&B reports are like personal credit reports for businesses and are issued by the credit reporting agency Dun & Bradstreet. Companies typically check a D&B report when negotiating payment terms and lenders will also sometimes check when assessing a business borrower. If your company has ever made late payments to a vendor, creditor, or lender, it’s possible that they reported it to Dun & Bradstreet. If this is the case, you’ll already have a D&B report which you can search for on the Dun & Bradstreet website. If not, you can also create your own company’s D&B report for free by obtaining a DUNS number and fill out the necessary information. report even if you haven’t created one yourself. If there’s a file on you created by your creditors and you don’t know about it, you’ll want to see it and improve it. Some of this information, such as financial statements, is voluntarily provided by the company. Other information, such as industry data and public filings, is taken from public records. Information such as late or delinquent invoice payments are reported by credit reporting companies and/or collection agencies. Early or on-time payments are reported by vendors and creditors. Larger vendors like Home Depot do this automatically. Otherwise, you can ask them to report early or on-time payments or pay Dun & Bradstreet to collect the information themselves. PAYDEX Score (1 – 100) – A score that rates a company’s ability to pay its debts over the past 2 years, with 100 being the best. Credit score (101 – 670) – A score that predicts the likelihood a company will default on its payments over the next 12 months, with 670 being the least likely. 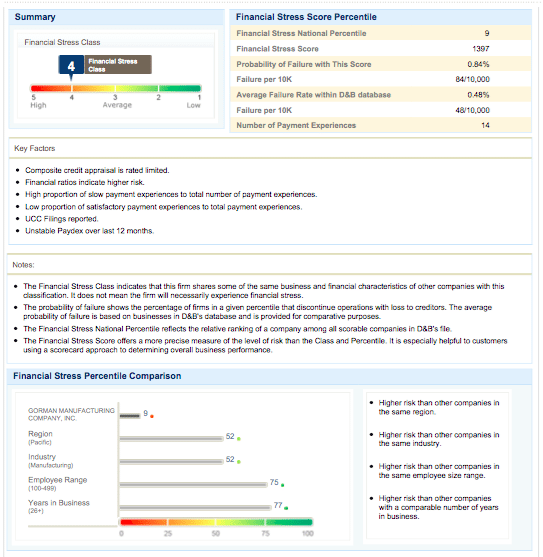 Financial stress score (1,001 – 1,875) – A score that predicts the likelihood that a business will fail over the next 12 months, with 1,875 being the least likely. In addition to these three scores, a D&B report will also have such scores as the D&B rating and the D&B viability rating, both of which help indicate a company’s financial position and current condition. Why is a Dun & Bradstreet Report Important? A D&B report is important because it’s used by vendors and creditors to assess the creditworthiness of a company. D&B reports can be created by creditors and are available for purchase, allowing third-party companies to check your business credit. You can also get ahead and create your own D&B report with accurate information and use it as a bargaining chip. For example, if a company can negotiate net-30 payment terms or better with their suppliers, they can float supplier payments until they’re paid. To help with the payment term negotiations, you can use a D&B report to prove the reliability of your company. Without a D&B report, your business might not be able to negotiate net-30 payment terms, potentially forcing you to rely on invoice factoring or some other short-term working capital loan. These short-term financing options such as invoice factoring can cost as much as 15% – 60% or more. Using another example, if you’re a vendor or supplier, you can look at a company’s D&B report before extending net terms to them. If the D&B report has bad information and bad scores, you can require upfront payments. If the report is good, you can safely offer them net payment terms. will often print out their D&B report and include it along with a bid to a potential account or partner. What this does is it causes the potential account or partner to pull the D&B reports of competing companies. If the business’s credit is better than the rest it might win them the deal. This is why it’s important to apply for a DUNS number and generate a D&B report for your company. It gives you an independent review of your business that you can use to your advantage. Further, it gives you a chance to ensure that your business information is accurate and it’s free of charge. Who Can See Your D&B Report? Once a D&B report is generated, either by a creditor or by the company itself, anyone can purchase access to the report. This means that your vendors, lenders, or partners will all be able to see the Dun & Bradstreet independent review of your credit, including your company and industry information. Third-party companies and lenders can look up your D&B report by searching for your DUNS number and purchasing access to your report. 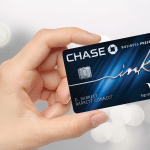 However, this isn’t a hard credit check nor a soft credit check and isn’t something you should shy away from. A Dun & Bradstreet business credit report, like we just discussed, is advantageous and is something you should have. However, as we mentioned, some of this information, such as company financial statements, is provided by the company itself. Businesses can choose not to provide this information when creating a DUNS number on the Dun & Bradstreet website. Although, it’s important to keep your information updated and accurate, otherwise you might risk credit scores based on incomplete data. A good rule of thumb is to check your Dun & Bradstreet account at least once a quarter. Keep your information fresh so that creditors see an accurate picture of your company’s creditworthiness. For more information on building business credit, you can read our article on how to build a business credit score. Basic company information – Includes year founded, number of employees, working capital, sales data and net worth information. D&B rating – Provides information on the size of the company and its overall credit worthiness. 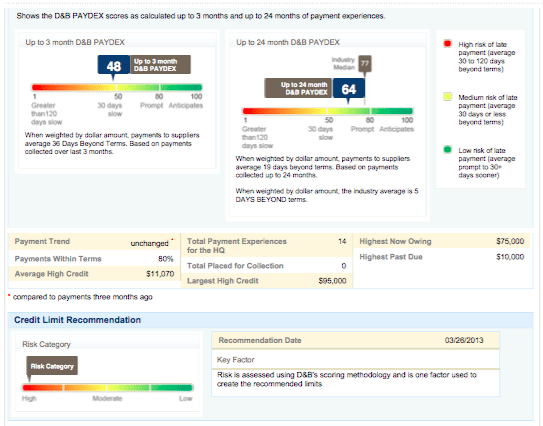 D&B PAYDEX score – Rates the ability of the company to make payments over the past 2 years. 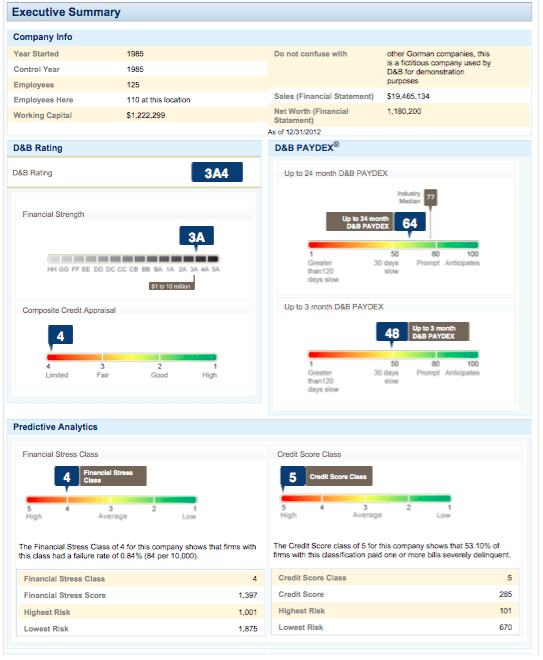 Predictive analytics – Financial stress and credit scores that assess the future solvency of the company. Credit limit recommendation – Assesses the credit demands of a typical company of the same size and scope. D&B viability ranking – Compares predictive risk indicators to assess whether or not a company will be in business within 12 months. The basic company information is collected by Dun & Bradstreet through the Secretary of State, direct investigations, trusted news services, and the SEC. Company information is automatically updated once a year. The other scores and ratings in the executive summary are based on information collected by Dun & Bradstreet and provided by the company itself. This information includes overdue and outstanding invoices, historical performance, industry data, and more. We discuss these scores and ratings in further detail in the sections below. The business summary includes such information as financial condition, SIC industry code, NAICS industry code, and a snapshot view of the company’s history. This information, like the company information above, is compiled by Dun & Bradstreet through the Secretary of State, direct investigations, trusted news services, and the SEC. 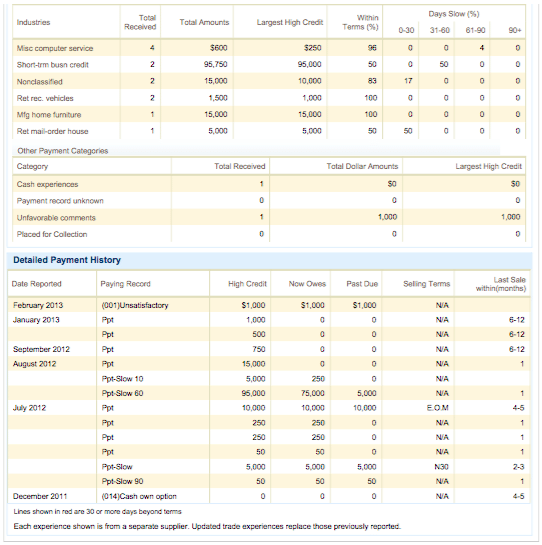 The credit capacity summary is used to gauge a company’s ability to take on new debt. It assesses the size of a company (based on net worth) as well as its financial condition and payment capacity. Included in the summary is a snapshot of a company’s payment activity, which is usually comprised of invoices owed to, or paid to, vendors. Overdue invoices are reported by collection agencies and filing companies. Early or on-time payments are reported by vendors or creditors. However, companies can either ask them to report or pay Dun & Bradstreet a small fee to collect the information. The D&B report goes deeper into credit capacity in the sections below. 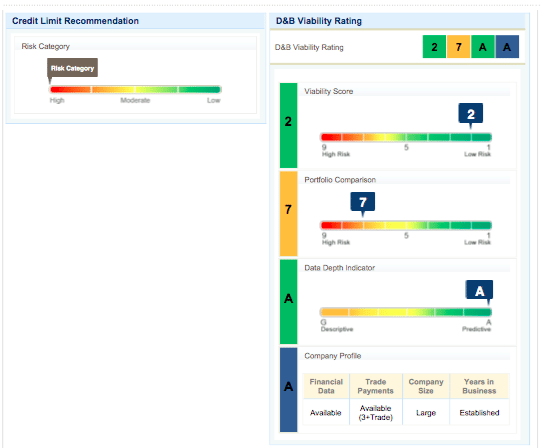 Viability score – High-level risk indicator that assesses future business solvency by comparing it to all U.S. businesses within the Dun & Bradstreet database. 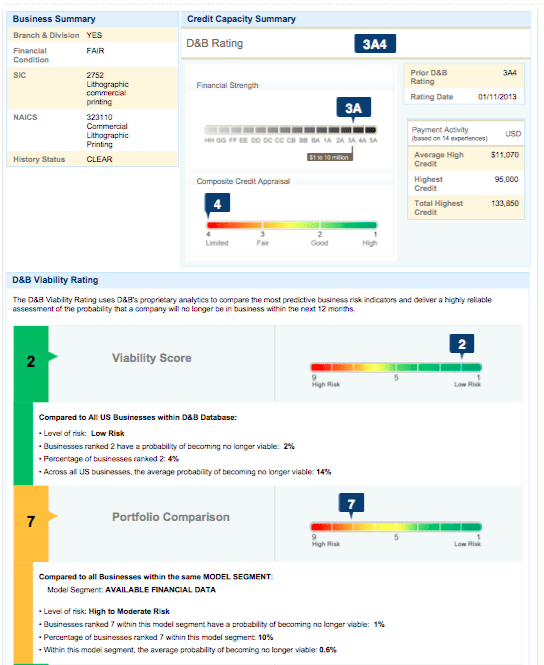 Portfolio comparison – A more in-depth risk indicator that assesses company viability based on similar businesses within the same Dun & Bradstreet model. 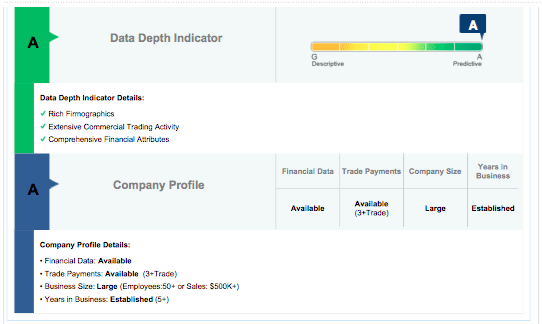 Data depth indicator – Measures the amount of data available on the company, which assesses the preciseness of the viability rating. 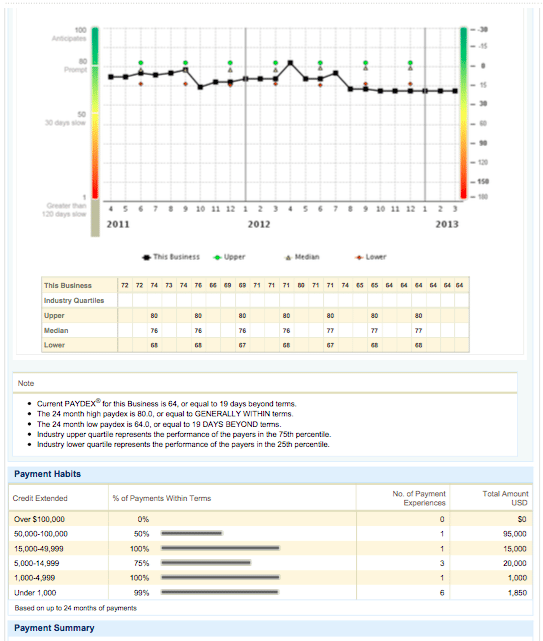 Company profile – Financial data, trade payments, company size, and years in business. Company-specific information used in the D&B viability include such things as vendor payment history, working capital, net worth, and financial performance. Most of this information is provided by the company itself, while delinquent payments are reported by collection agencies. Comparable business information is provided by Dun & Bradstreet. A company’s business history includes information on its incorporation date, officers, directors, as well as the location of its headquarters. It’s here that you’ll find the birthdate, education, business background, control date, and more of the people who run the company. It’s also here that you’ll see the past criminal proceedings and business failure of the business owners. Basic information is provided by the company. However, Dun & Bradstreet also compiles its own information using the Secretary of State, direct investigations, trusted news services, and the SEC. The business registration section on a D&B report shows you the legal structure of a business as well as information regarding its incorporation and control. For example, the business registration section will typically have the registered name of the company, business type, incorporation type, incorporation date, as well as the location of incorporation. This information is typically provided directly by the business and not by Dun & Bradstreet. For this reason, there is often a disclaimer on a D&B report’s business registration section denoting that the information is not verified. This information is reported by Dun & Bradstreet and the details are provided by the federal government and other reputable sources. A company will therefore not have to provide this information itself. The information on a company’s operations is provided by the company itself. The industry data section of a D&B report simply displays a company’s SIC code and NAICS code, both of which identify the industry that a company operates within. The information is provided directly by the company. This is important because often times one company will have financial or legal responsibility for the other. Dun & Bradstreet collects this information within its database of companies and automatically links them together. This means that family trees are not always available. 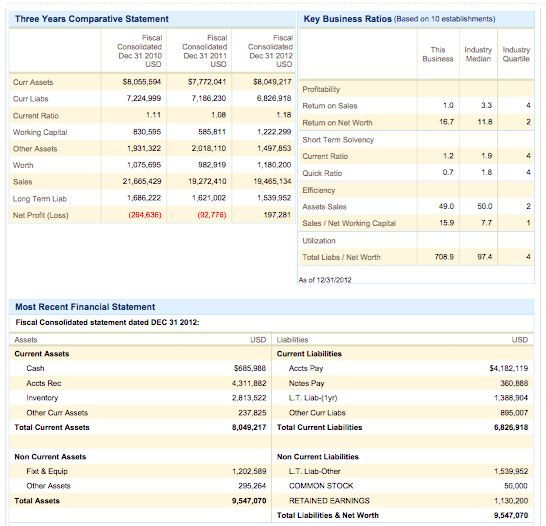 The financial statements section of the Dun & Bradstreet business credit report compiles the most recent three years income statement, balance sheet, and statement of cash flows. These financial statements are provided by the company and are used to assess the past, current, and future performance of the company. While this information can be sensitive, it’s necessary in order to generate such scores as the viability score, financial stress score, and predictive analytics. Omitting this information will hurt your data depth indicator score, meaning that your D&B report won’t be reliable. A company’s public filings section on its D&B report is comprised of a public filings summary as well as a list of full findings. 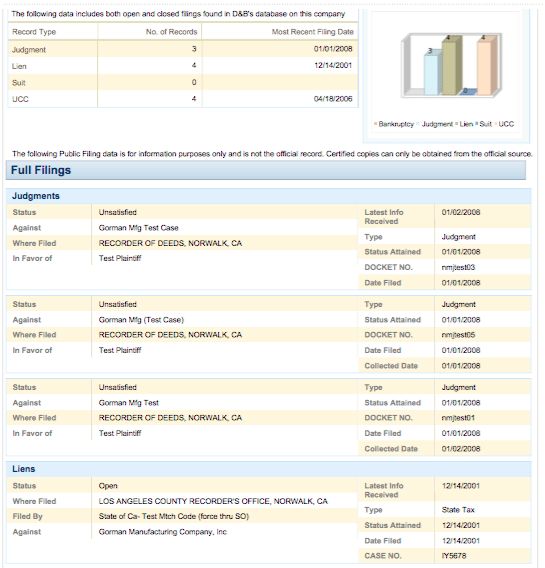 In the public filings summary area, you’ll find the high-level numbers of judgments, liens, suits, or UCC filing liens against the company, including the most recent filing dates. For each of these judgments, liens, and filings, the D&B report will report on the status of each, who it’s against, where it was filed, and who was ruled to be in favor. These scores are used to determine how likely a company is to pay its future creditors, based on past company performance as well as the performance of similar companies and industry norms. Within the section are charts and graphs that compare the company to other industries, regions, as well as pools of comparable businesses. Information for the commercial credit score is given to Dun & Bradstreet by the company via its historical financial statements. Early or on-time payments are also reported by the company and verified by the vendor or creditor. Delinquent payment information is obtained from debt collectors and debt filing companies. Together, these numbers measure the likelihood that a company will fail over the next 12 months, based on its historical performance as well based on the performance of similar companies. The analysis includes the probability of failure as well as the average failure rate using data within the Dun & Bradstreet database. Historical performance information is obtained through a company’s financial statements and late or delinquent payments reported to collection agencies or filing companies. Early or on-time payments are either reported by vendors or creditors or collected by Dun & Bradstreet for a fee. The advanced PAYDEX score section is an in-depth breakdown of the PAYDEX number displayed in the executive summary. The PAYDEX number is used to assess a company’s ability to make creditor payments for the past two years. It’s here that delinquent payments and late payments, as well as early or on-time payments, show up on a D&B report. The PAYDEX score ranges from 1 – 100 and is a dollar-weighted indicator of how well a company pays its bills. This means that late payments on high invoice amounts, for example, are weighted more heavily than late payments on small invoice amounts. Late and delinquent payments are reported by vendors and creditors to collection agencies and credit reporting services, who pass on the information to Dun & Bradstreet. Creditors and vendors can also report the delinquent payment activity directly to Dun & Bradstreet. On the other hand, early payments, payments made within a discount window, and on-time payments are reported by vendors or creditors. This makes it a huge deal to work with your vendors and creditors and have them report your payments in good standing. The PAYDEX scores are based on the detailed payment history and the payment summary at the end of this section. Payment history includes early, on-time, or late payments to vendors, credit card companies, lenders, and other creditors. The better the payment history the higher the PAYDEX score, and vice versa. Payment habits break down the percentage of payments made within certain credit limits. It’s here that you’ll turn to if you want to see how well a company has been able to pay its past creditors. A D&B report is a business credit report used to assess the creditworthiness of a company. 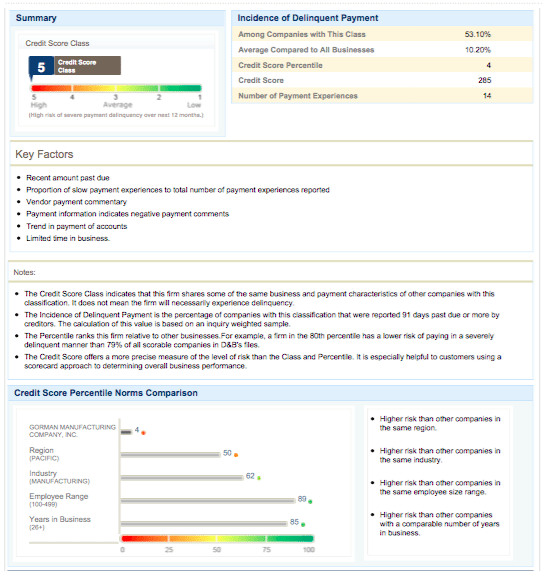 A D&B report typically has three main scores that assess this business credit, which includes the PAYDEX score, the commercial credit score, and the financial stress score. Each of these scores provides information into the current and future performance of a company. Dun & Bradstreet business credit reports are an independent assessment and can be used in many situations. For example, a good D&B report can be used to negotiate payment terms with suppliers or more favorable loan terms with lenders. 1. Business credit and payment history will only be reported to D&B if the payment meets the minimum requirement of $50 or more. Some companies only report on clients who have spent $100 or more, and others have set their minimums even higher. 2. If you have made payments to your suppliers are they are not being reported to D&B, check to make sure you used a business bank account or business credit card to make those payments. If you’re using a personal account or personal credit card, the transactions are considered to be personal in nature, not business. D&B works very hard to make sure that only business transactions reach the D&B file, so transactions paid using personal payment methods can oftentimes be discarded for that reason. 3. Also check to make sure your vendors and suppliers are billing your business at the correct business address and have the correct business name on the invoices. That information needs to mirror exactly to the business name and address in the D&B report. If it doesn’t match exactly, even auto-reported payments may not find the correct match and show up in your report. 4. 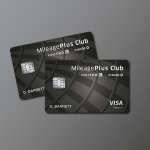 You do not have to purchase any services or pay any fees to D&B to build your credit or boost your scores and ratings. You can view the information in your report for free at D&B iUpdate portal, and you can set up a free monitoring service (CreditSignal) on their eCommerce website. The only time you may be required to pay for a service is to use the CreditBuilder to upload a list of your existing vendors and suppliers, and you can actually just purchase that service on a month-to-month basis for a relatively low fee. 5. Check D&B’s database to make sure there is only one report for your business and that the data in that report is accurate. Oftentimes, your suppliers may be reporting to a file that no longer exists. If you update your address with a supplier, you also need to update your D&B file to reflect that same address. If you use a mailing address that is different from your billing address or shipping address, information about the transactions will be discarded. 6. There are thousands of companies that report on their business customers, so don’t limit yourself to just the few that always make these lists. To boost your scores and ratings higher, you should use a well-rounded group of suppliers, with some who serve all types of businesses, and then also some that are specific to your industry. Thank you, Joy! This was a tremendous help. Until I read your comment, all I could find were D&B options that I had to pay for. You saved me much time and money! Thanks so much for all the great information! This definitely provides some great info for the Q&A section. We’ll be sure to consider everything you’ve said and update the information accordingly. Don’t bother with D&B, it is an extortion racket to milk you of your money. DO not get a D&B number as they will only report on or two lines of trade and give you a poor score with your only solution to pay them to report other lines. DO NOT GET A D&B UNLESS YOU HAVE TO HAVE IT. I am in the financial industry and we check D&B all the time, if you don’t have a D&B there is no penalty, but if you do it can cost you additional money to purchase insurance unless it is strong. Believe me it wont be strong until you fork out $800 to pay these extortionists off !!!!! Thanks for chiming in on this subject. I know lots of people having plenty of complaints on how credit reporting is handled (both personal and business). It sounds like your saying that your D&B report can have an impact on the rates a business will pay for insurance. What kinds of insurance will this have the biggest impact on? What if someone has relatively thin traditional credit report (on Experian or Equifax) because they haven’t really utilized much credit ever but they do have a lot of trade partners that could report to D&B? Would you say it makes sense then? Looking forward to getting your insight on this. I have been in Business of my own for 18 years. I find that anyone giving you or your new business any kind of a credit, looks at your personal first. Once you have established your personal good credit the rest follows. Until today I have never needed D& B Services. They won’t do anything that you can not do yourself and those outrageous fees!!!!! ?? I don’t like the fact that they collect unauthorized information and sell our information. I decided to finally talk to someone today and find out more about this company, but, I was even more disappointed today….. They don’t have even 1% of the information about our company. So those companies that pay money to D&B to find out about my company, surely don’t know where to find information. And if they do get information provided by D&B, it is inaccurate and unauthorized by me, (as a business owner), Waist of money if you ask me . Our company was involved in an asset purchase. The name of the company changed.There are liens against teh old company and our new credit history is non existant. How does our new company add new credit info? I have already files a dispute for the inaccurate credit info but I still need to remove the liens? If you’ve paid off the liens on the old company, you should contact the lender that placed the lien and ask them to notify the business credit bureaus that there’s no longer a lien on the company. You can also contact the business credit bureau to file a dispute, but sometimes it’s faster to just contact the creditor directly. Also, most business credit reports have a section of the report that says “related businesses.” Once you have the lien removed, you may be able to identify the old company as a related company. You should contact the business credit bureau for more details. As for building credit for the new company, there are some tips in this article for how to build business credit. Priyanka – Thank you for your response. Unfortunately as the sale was an asset purchase, the liens were never satisfied. We were under the assumption that if we changed the name of the company slightly we would be in a postion to qpply for a new D&B under our new Tax ID number. D&B has advised us that this is not possible. They suggested the $1,799.00 subscription to “dispute negative info and add our current postive credit history.” I haev since researched this approach an read that this service is unreliable, inconsistant and borderline fraud! As a new business I am interested in improving my Dunns credit. I have been contacted by a company wanting to charge a little more than 1300. Is this a good price or can improving business credit be done on my own? And if so, how? Thanks for getting in touch with us. Just as with improving personal credit, you can build business credit with the assistance of a credit repair company or on your own. *Open a business checking account at a bank that reports to business credit bureaus, and use it only for business expenses and deposits. 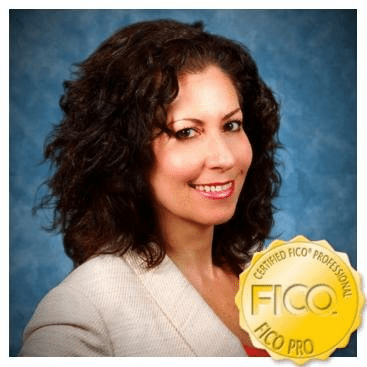 Before paying any business credit repair service, make sure you know exactly what they will doing for you, how long it will take to see improvements in your score, and what you will be paying for. There are many good credit repair services out there, but unfortunately, there are a lot of scams too. Find out what other customers think of the company before committing to paying them. For more help on how to improve your business credit score on your own, see our guide How to Build Business Credit & Improve Your Business Credit Score.